Playing along with AAA Cards challenge "Chilled" today. 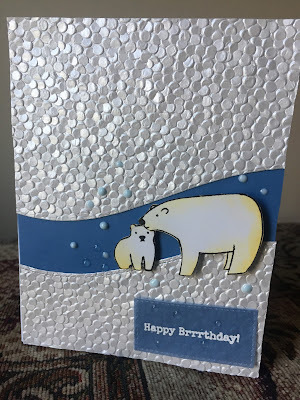 Besides loving this cute Arctic Pals stamp set from Ellen Hutson I just had to use some of the paper I bought last month, Freshwater Pearls. It's so shimmery! Here's the link. First I cut a piece of the specialty paper using my Lawn Fawn Stitched Border die, then glued a piece of blue vellum behind and trimmed the whole thing to 4.25 x 5.5. 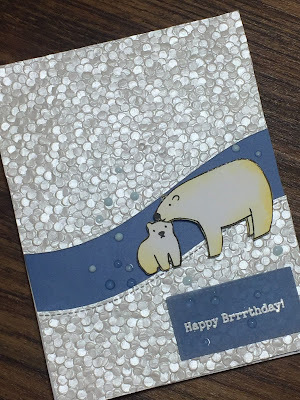 Secondly I stamped the bears in Versafine onyx, then embossed with clear powder. Using a tiny bit of distress oxide in Antique Linen and Fossilized Amber, I gave their fur a little bit of color. I fussy cut both bears (can you believe that once upon a time I had to look up the term "fussy cut?" Took me forever.) and attached them using pop-up foam dots. The sentiment was stamped onto a piece of vellum using versamark, then embossed in white. I used a Dotliner to adhere the sentiment; doesn't show through the vellum but still holds. Lastly, I added several icy snow drops using Nuvo crystal drops in clear and robin's egg blue. I made another, similar version, this time using a single bear and a piece of cardstock from Carta Bella. I think the tree silhouettes give it a very chilly night feeling, don't you? Oh my goodness! 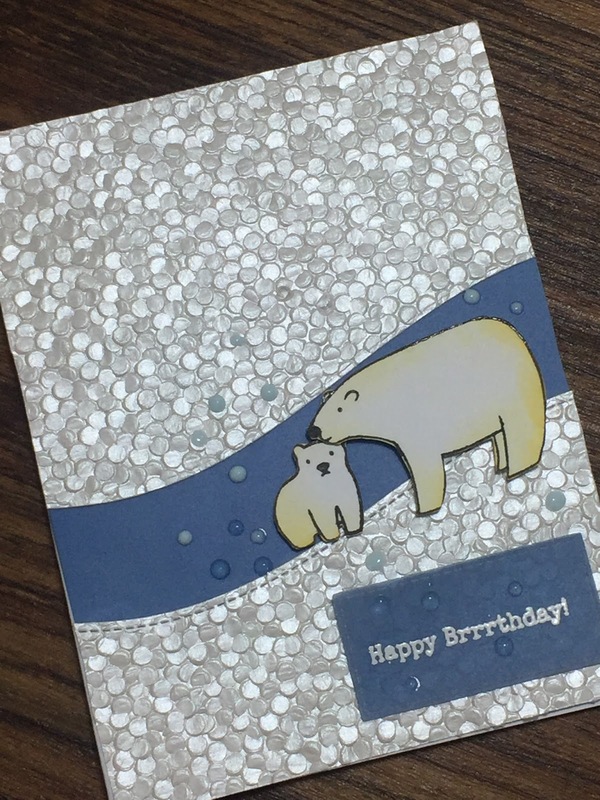 Such a sweet card - love that little bear! I am captivated by that gorgeous paper - may have to track some down!! Thanks for playing along with us at AAA Cards! Thanks, Lucie! I know, that paper is lots of fun and so unique. I just put a link in my blog description. 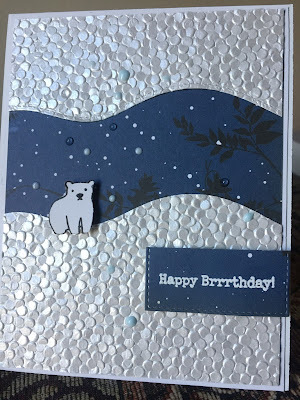 Wow that’s very shimmery paper and so unusual! Mega cute little bear playing in the chill. 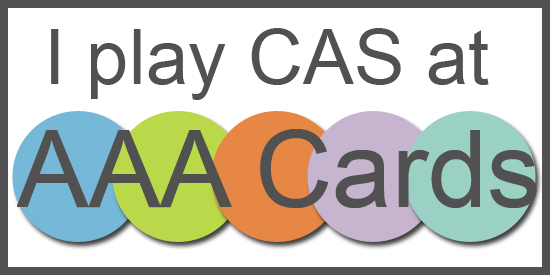 Thanks for joining in with the AAA Cards chilled challenge. Thank you, Jane! I just put a link above to the shop where I bought the paper, if you're interested.